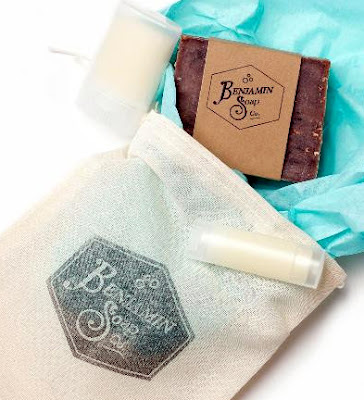 Annie's Artist Lookbook: Benjamin Soap Co. 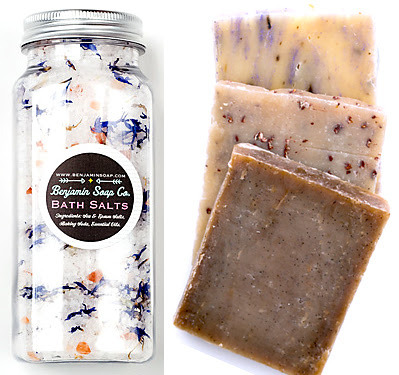 Pure Artisan Bath & Beauty Products for Craft Conscious Buyers. 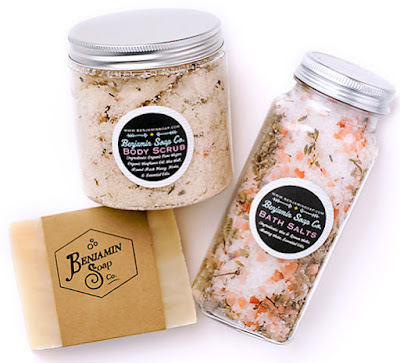 Soaps, Balms & Lotions Made with Love that You'll Love to Use. Images by Benjamin Soap Co. In an age of mass manufactured everything, isn't it refreshing to find something simple, pure, individually made and one-of-a-kind? I could be describing just about anything featured here in my blog because I'm a big believer in handcrafted goods, but in this case, I'm referring specifically to an artisan soap maker. Jae Benjamin of Benjamin Soap Co. found her calling after being unable to find all natural bath products that suited her daughter's needs. Ironically, thanks to mass dissemination of information across the Internet, another product of our age, this local artist has taught herself how to make soaps, lotions and more that meet her standards of purity. Along the way she discovered a joy in making something all natural and all her own, and we're very lucky that she shares this with us. Jae is not lacking in ambition; through exploration and experimentation, what started as a simple line of soap bars is now wide selection of beauty products, all with natural, locally sourced ingredients that you can feel good about using. Plus, they'll make you feel good as you use them because their handcrafted purity is gentle on your skin, and their blend of essential oils creates delicious, comforting scents. Oatmeal, Honey, Lavender, Mint, Ginger, what's not to love about these aromas! Consider the bath and beauty products you rely on everyday. How many of these have ingredients you recognize? Take a chance on something handmade, and you'll enjoy the wonderful benefits of all natural simplicity!